Children born to obese mothers who are exposed to High-fat Western diet while in the womb tend to experience accelerated fibrogenesis in the liver and are at higher risk of developing NAFLD.Dr.Karen Jonscher, associate professor of anesthesiology at the University of Colorado Anschutz Medical Campus in Aurora and associates have found that a compound found in kiwi, celery, and papaya — called pyrroloquinoline quinone (PQQ) — prevents and halts the progression of non-alcoholic fatty liver disease (NAFLD).Researchers concluded that PQQ plays a role in the prevention of nonalcoholic fatty liver disease.The findings of the research have been published in journal Hepatology Communications. According to Scientists maternal obesity creates an inflammatory environment for a baby in the womb which creates numerous consequences later on and plays a role in the juvenile innate immune system and microbiome that may predispose a child to development of the fatty liver disease. 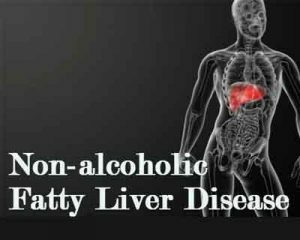 Non-alcoholic fatty liver disease (NAFLD) is a very common disorder and refers to a group of conditions where there is accumulation of excess fat in the liver of people who drink little or no alcohol.It is estimated that NAFLD affects between 30 and 40 percent of adults in the United States, making it one of the most common causes of liver disease in the country.Obesity, high cholesterol levels, hypertension, and high triglyceride levels are key contributors to NAFLD, and these conditions often arise as a result of a high-fat diet. NAFLD is part of the metabolic syndrome characterized by diabetes, or pre-diabetes (insulin resistance), being overweight or obese, elevated blood lipids such as cholesterol and triglycerides, as well as high blood pressure.The majority of individuals with NAFLD have no symptoms and a normal examination. Children may exhibit symptoms such as abdominal pain, which may be in the center or the right upper part of the abdomen, and sometimes fatigue. However, other causes of abdominal pain and fatigue should be considered. On physical examination the liver might be slightly enlarged and some children may have patchy, dark discoloration of the skin present (acanthosis nigricans) most commonly over the neck and the under arm area.Some patients who develop cirrhosis may eventually require a liver transplant.